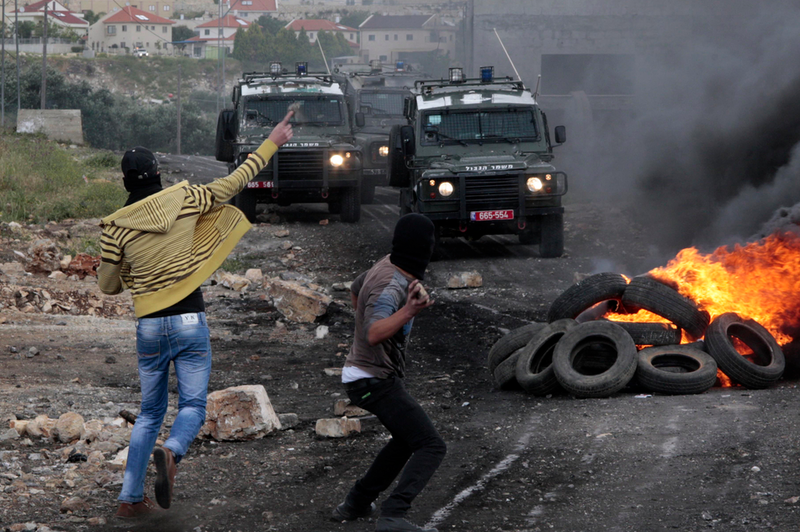 Photographs of Palestinian youth throwing stones and brickbats at Israeli troops are a dime a dozen. Barely a day goes by that one or two don’t show up in one or another of the major news media slideshows. And they are generally all the same more or less. The photograph above, which appeared in several media sources this past week is typical and altogether unexceptional when compared to all of the others. The Palestinians are rarely recognizable beyond their jeans and the face masks they wear, and, of course, the fact that they are brandishing primitive weapons—stones and sometimes slingshots—against a modern and state based military. The Israelis are no less typecast, wearing military uniforms and wielding the accouterments of contemporary warfare—automatic weapons, tanks, etc. Sometimes the Israeli’s are not visible within the photograph, but their physical presence is always implied and it is hard not to imagine them looming just outside of the frame of the picture. Usually shot in neutral tones of greys and browns, the sky typically overcast and the scene shrouded in smoke, the aesthetic is altogether dreary—an affect occasionally accented as by contrast with images of burning tires or other kinds of explosions. Such photographs are so common that I barely pay any attention to them anymore, which raises the question, why do they keep appearing and with such stereotypical ubiquity? This is not a rhetorical question that I will answer later in this post. I truly don’t understand why such images appear with such frequency. Surely such images play to both sides in this long and fraught controversy, Israeli supporters seeing vigilantes and guerilla warriors threatening national security and Palestinian supporters seeing the oppressive forces of an occupying power, but such appeals in themselves doesn’t seem quite enough to warrant their near constant publication and circulation. Nor do they seem to have an especially powerful effect on those who don’t know quite which side in this controversy to favor. I suspect that many simply don’t see the images at all, glancing at them at best—as have I in the past—as their eyes move to the next image in an on-line slide show or turn the page in a magazine or newspaper. Two things called my attention to the image above this weekend. The first was a slideshow at “Daily Life.” This is a regular feature at The Boston Globe’s Big Picture in which sluice of life images from around the world are brought together to create something of a “feel good” affect, though I don’t mean to suggest that all that we see are pictures of puppy dogs lapping up ice cream cones. Rather, the images call attention to the rhythms of everyday life across the globe, often featuring a sensibility that makes “us” and “them” simultaneously similar and different from one another. Sometimes the pictures feature the altogether ordinary and sometimes they feature a devil may care attitude, but always they underscore daily living. And so we see everything from Indians praying to the God Shiva to window cleaners in Bangkok to a skier relaxing in Juneua, Alaska to a high school principal kissing a snake to two lovers on a bench in a piazza in Rome, and the list goes on. What we don’t see, of course, are Palestinians hurling rocks at Israeli soldiers, and yet this would seem to be every bit a part of daily life – and perhaps more so – as what we are shown. And again I ask, why? Part of the answer is that there is nothing “feel good” about the battle between Palestinians and Israeli’s but that only begs the larger question, why are we inclined to ignore this facet of daily life with its incredibly tragic overtones for virtually all involved. The second thing that caused me to contemplate the image above is the photograph below. It is a picture of a Palestinian boy carrying toy balloons past Israeli border guards in Jerusalem. It is a photograph that could easily have appeared in the “Daily Life” slide show, although it did not. And that too raises the question: why not? 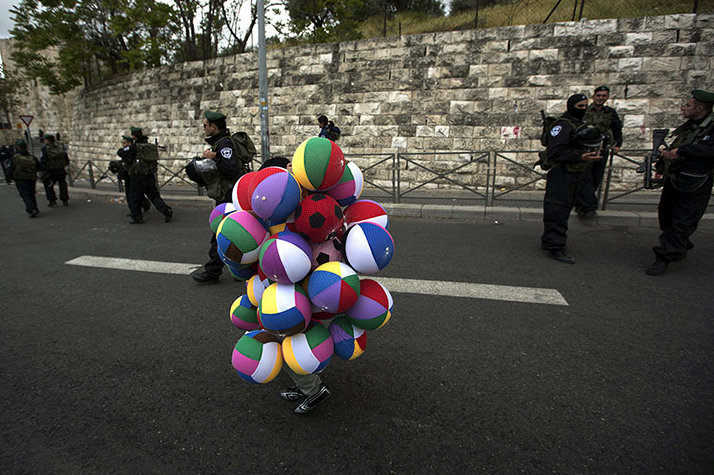 But there is perhaps a different point to make, for as with the stone throwers, the individual identity of the Palestinian child is obscured, here hidden beneath and behind the colorful array of beach balls which lend a bizarre quality to the image. Indeed, the boy seems altogether out of place as this does not appear to be a market square of any sort and the Israeli border guards seem to be ignoring him—or in any case not treating him as if he as any kind of threat. And, at least on the face of it, he is not. I am not at all sure I understand why he is there or what he is doing, but it does seem peculiar that the security guards show no concern. What is important, I believe, is that his individual identity is hidden (like that of the stone throwers) and can only wonder if the photograph doesn’t underscore as by contrast how surreal daily life is for Israeli’s and Palestinians alike. There is no real conclusion here, except perhaps for this: Photographs rarely stand in isolation of one another. It is up to us to look at them carefully and closely and in comparison and contrast to one another, and to wonder why we see them where and when we do and how they might function in their collectivity and relationship to one another to provide a picture of the world we might otherwise miss or ignore.